When you visit Craigslist, it’s almost as if you’re visiting the early 90s web. Blue links. That’s it. On one hand, you have to appreciate the simplicity (and speed). On the other, WTF? It’s 2011. Many competitors have tried to disrupt Craigslist in the past, and failed — often miserably. But there’s reason to believe the space is ripe for disruption now thanks to one key ingredient: mobile. That’s exactly what EggCartel is aiming to do. Their first product, EggDrop launches today on the iPhone and tomorrow on Android devices. 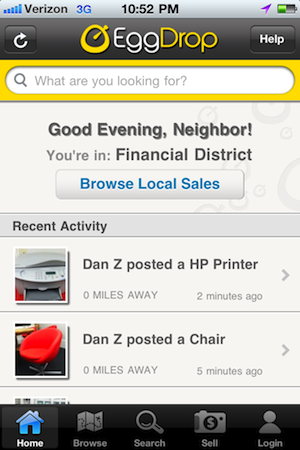 Think of it as a way to put a version of Craigslist in your pocket, but one that’s much more visual. And even more focused on location. And most importantly, one that’s much easier to add items to. That’s really the key to EggDrop. 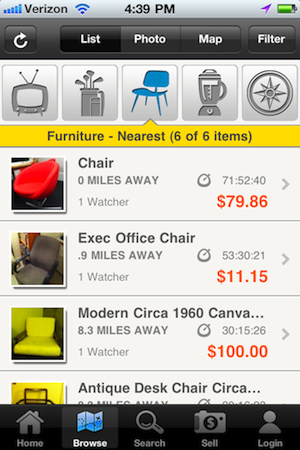 Adding items is as easy as taking one picture with your phone, setting a price, and uploading. You can add a title and other details, but EggDrop does the rest to categorize your product on the backend. From there, it’s listed in a location-based directory accessible by the apps. Users look for items they’re interested in and can watch them to see how the price fluctuates, or can put down a bid right away. It’s Dutch auction-style, so the price goes down over time if no one bids. Location plays a huge role in EggDrop because there is no shipping allowed. Every item sold and bought must be done so locally. So if you see a bike for sale, you know that it’s relatively close to you, and you have to go pick it up (or have the seller drop it off). “Location isn’t just about where you live or work, it’s where you are at any given time. Maybe a Star Wars action figure isn’t available in your neighborhood — but you go to LA and there it is,” co-founder Dan Zheng says. With this human interaction in mind, EggDrop is also doing something a bit old school — they’re leaving it up to the buyers and sellers to handle the transactions. That’s right, there is no fancy payment system within the app. When you buy something, you do it with cash, check, PayPal, or credit card (if the seller has something like Square). They’re thinking about partnerships in the future to handle payments within the app. So how do they avoid spam and fraud? A rating system is key to EggDrop. Once you buy and/or sell an item, you give feedback on that experience. If a person is marked as being a flake (they said they’d buy but never showed up) or as selling lemons, that rating stays with them. Just like eBay, the goal is to have a robust reputation system largely maintained by the users, that they can trust. We first covered EggCartel when they launched as one of the initial AngelPad companies late last year. Since then, they’ve been in private alpha testing with under 100 people. But the founders note that things have been going really well, and now they feel confident enough to open it up to all U.S. users. At the same time, they realize that things may be a bit slow in the beginning due to a lack of items listed, so they’ve created a wish list feature. If there’s something you’re looking for that isn’t listed yet, you can add it to your list and get alerted when such an item becomes available near you. Zheng and co-founder Brian Lynch expect that most people will use EggDrop to sell electronics, furniture, kids items, and things of that nature at first. But they note that already on their website in limited testing, they’ve sold a couple of cars. In terms of monetization, EggCartel doesn’t do the obvious thing in taking a cut of sales (because again, they’re not involved in the actual sales), instead they’re going to focus on adding premium features over time. But all that is in the future. For now, they just want to get users. To that end, EggCartel is offering TechCrunch readers a $5 gift (in the form of either an Amazon gift card, iTunes gift card, or donation to the Red Cross) if you list 5 items by noon PT on Friday. To claim this gift, simply email techcrunch@eggcartel.com from within the app (Account => selling => promote => email) when you hit your 5 items listed. The seven person team also has one other bit of exciting news today: funding. EggCartel has just closed a $1 million seed round led by SV Angel and BlueRun Ventures. Trinity Ventures and Charles River Ventures participated as well. You can find EggDrop in the App Store here. Look for it tomorrow in the Android Market.